This easy Creme Brulee recipe produces an awesome dessert. Hard to believe these simple ingredients can create something so creamy and rich. I have also included a delightful Irish Creme Brulee recipe that will impress your family and friends. Heck, it will even impress you. More homemade dessert recipes at the end of the page. Before diving into this easy creme brulee recipe, please read the instructions carefully. Beat egg yolks, 4 tablespoons of white sugar and vanilla until thick and creamy. Pour cream into a saucepan and stir over low heat until it almost comes to boil. Remove the cream from heat immediately. After pouring a little of the hot cream into the egg yolk mixture and whisking briskly, pour the cream/yolk mixture into the rest of the cream and whisk. There will be a lot of foam on the top. Skim this off with a strainer and throw away. Pour the hot mixture into individual serving dishes or ramekins and place in a baking dish. Set the dish with the ramekins in it on your oven shelf, then pour hot water in the dish so the water comes halfway up the sides of the ramekins. Bake at 375 anywhere from 15 to 30 minutes. They are done when you shake the dish gently and the brulees jiggle just slightly in the middle. Remove from oven and let the brulees cool in the water bath for about 15 minutes, then remove and put the brulees in the refrigerator to chill. Just before serving, sprinkle the tops with white granulated sugar and shake off the excess. Place under broiler til caramelized or use a propane torch to burn the tops. Serve immediately. Following is another easy creme brulee recipe. I have garnished creme brulee with candied nuts, and fresh cranberries make it festive. 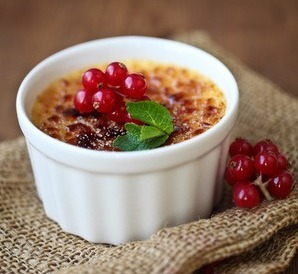 Please read the instructions and tips before making this luscious and easy creme brulee recipe. PREHEAT oven to 300 degrees. Place 6 ramekins on a towel set in a roasting pan at least 3 inches deep. Stir together cream and sugar in a saucepan over medium heat, and cook until very hot, stirring until the sugar dissolves. Whisk together egg yolks, vanilla, and Irish cream until combined. NOTE: Slowly add 1/3 of the hot cream, whisking it in 2 tablespoons at a time until incorporated. Once you have incorporated 1/3 of the cream, you can stir in the remaining hot cream without fear of the mixture curdling. Whisk together egg yolks, vanilla, and Irish cream until combined. After whisking, wait for the froth on top of the mixture to dissipate before pouring into the ramekins, otherwise you will have bubbly tops that are not so appealing. Pour custard into the ramekins, then fill roasting pan with boiling hot water to come halfway up the sides of the ramekins. Bake until set; 50 to 60 minutes. Suggestions: Be very careful not to let the liquid get too hot. To test when it is ready, coat the back of a spoon and run a line with your finger down the center. If the line stays, your liquid is hot enough. If it curdles, blend it with a small amount of milk and pour it through a strainer. Also, cook the custard to between 165 & 175 degrees. Any higher and it will separate.